Both accounts start out almost exactly the same but the second account adds “of Nazareth” to Jesus’ quote and excludes “it is hard for thee to kick against the pricks.” In the first account the men that were with him heard a voice and saw no man, but in the second account they saw a light but heard no voice! The exclusions and additions could be excusable but the direct contradiction in the latter case is somewhat of a mystery to me. Ultimately, I’m not bothered by it. It seems like the main point being made is that Saul’s companions witnessed a small portion of his experience in one way or another. Alma leaves out “go thy way” and the part about the people’s prayers being answered. In the original, the request to not destroy the church is listed first while the part about him being cast off is listed last. In his latter account the part about him being cast out, or as he says, “destroyed” is listed first while the part about destroying the church is listed last. It seems that even though the angel spoke certain specific words to him, he heard them differently. He lists his own destruction first, that’s what worried him the most, and the second thing he listed was the main thing that he needed to stop doing immediately to avoid said destruction. Both of these versions occur in the same conversation contained within three verses, so why wouldn’t he just quote the angel the same way twice? I’m not sure we will ever know for sure, but I wonder if he changed the wording to further emphasize a point to his son. The last version seems to emphasize that ultimately we cause our own destruction. It’s not something God threatens us with, it is a suicide that he is trying to protect us from. I think that Alma understood this and intentionally crafted his words to not just regurgitate the facts of history, but to emphasize principles garnered from that experience that could benefit his audience. I’ve related sacred experiences to a variety of audiences and I don’t think I’ve ever retold those experiences the same way twice. I altered them depending on the understanding of the people that I talk to. The reason for sharing the experience is often to illustrate some principle rather than to lay out facts. My journal recorded certain sacred experiences in varying degrees of detail. One journal entry is a pretty good at covering the essentials of one event, but it doesn’t have everything. Another sacred entry says only, “Remember what you learned” and there are other similar examples. About 8 years after the events of my mission, I was dissatisfied with the lack of detail in many of my journal entries and certain events were completely missing. I took the time to start at the beginning and write a complete narrative of the events so that they could all be recorded as accurately and with as much detail as I can remember. If you took my original journal and compared it with my more detailed accounts 8 years later, and compared those with other people’s recollections of the versions I shared with them. You would probably see something remarkably similar to the various accounts of Joseph Smith’s first vision. 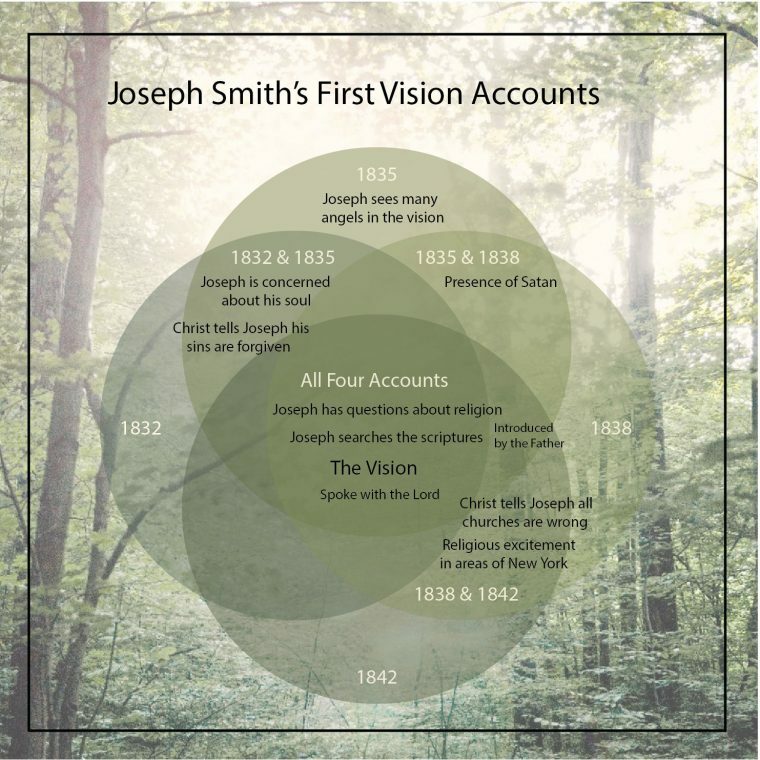 Now, I didn’t original intend for this post to be an apologetic piece to explain away Joseph Smith’s various accounts of his first vision. I originally set out to note a difference in how Alma seemed to remember his experience with the angel. Then I thought about Saul so I worked that in. Next came my own memories about my own journals and recollection of events and how it gave me some additional insight to Joseph Smith’s first vision accounts as they were recorded and remembered over the years. A lot of people have issues with that, but like I said earlier with Saul’s experiences, none of it bothers me. I know from personal experience how hard it is to retell a sacred experience. It’s nothing at all like recalling lunch with a friend or a movie you saw. Interaction with the divine rarely leaves one with a single point of view and often many purposes are served simultaneously. Much like scripture, these events continue to unfold new ideas to your understanding as you reflect upon them in time. I find this stuff pretty interesting, and I’ll bet there are even more examples of these kinds of things in scripture. If you can think of any, post them in the comments below.